Join us for our friendly Art Therapy group where being creative is fun for everyone, including those with disabilities. This unique class is open to all ages and abilities, and is also great for people with learning or physical disabilities and their carers. 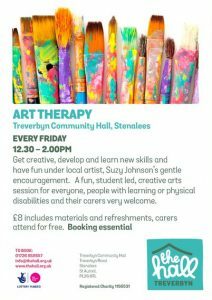 Under the gentle support of art therapist and teacher Suzy Johnson, you will have fun with drawing, collage, paints or sculpture. So come along and experience the joy of creating because art should be available for all. Booking essential. Contact Us to book your Art Therapy place today. £8 per person per session, includes materials & refreshments.